I wanted to go in a bit more detail about the health testing we do, and any good breeder should do. I have spent almost three decades learning all I can about all aspects of dog care, and now dog breeding. It's not something I take lightly. If you are going to pay good money for your next companion, you may as well do all you can to ensure the parents of your future puppy are as healthy as can be, and that your pup has the best chance possible of being the same. We start with trying to learn all we can about the pedigree of a dog. We are not just looking so much for the number of titled dogs (conformation show champions, working trial champions, obedience, agility and other performance titles and so on) although those things are important. Titles tell us if the dogs in the pedigree were capable of performing well in various venues. We are also looking for dogs we know have either produced health problems (to avoid the dogs) or haven't (in hopes of keeping that good record in our lines.) We look at structure (how a dog is built) and breed type (how well a dog adheres to the written standard of perfection for AKC and ASCA.) Dogs with correct structure will remain sound into old age, as opposed to dogs with poor structure who may break down while they are young. And we put a LOT of weight on what kind of temperaments the dog has produced, since that is what will affect their ability to fit in with a life with humans. Some tools good breeders have at their disposal include the OFA (Orthopedic Foundation for Animals) for hips and elbows, CERF (Canine Eye Registration Foundation) for eyes, and with Aussies, the VCPL which offers MDR1 testing. This is a DNA test to see if an Aussie carries one or two copies of the gene mutation which can cause reactions to various drugs and medications, some serious or even fatal, to carriers of the mutation. Another critical test is for hereditary cataracts from the Animal Health Trust in the UK. It is a DNA test for the HSF4 hereditary cataract mutation. A dog with even one copy of the mutation will be at far higher risk of developing cataracts. I will have links to these groups on my links page and at the bottom of this page. To complete the testing we do on each dog, as well as fulfilling the DNA requirements for the registries will cost between $700-$1000 per dog over the first couple years. This cost may vary for breeders depending on where they live and the vets and labs they use. It is a small price to pay to help reduce the risk of hereditary defects in the dogs they produce. This does not include regular health care any dog would receive, but the extra screening done including x-rays and OFA assessments of hips and elbows, HSF4 testing, annual CERF eye exams, MDR1 testing and so forth. We'll start with CERF/CAER exams. Since various eye problems are common in all breeds and mixes of breeds of dogs, including Aussies, each year we get all our dogs' eyes examined by a board certified canine opthamologist. Most of the time we are able to get our pups' eyes checked before they leave for new homes, which is ideal. The puppy exams can depend on weather and timing, since our eye doctor only holds clinics once, and sometimes twice a month, 100 miles from here. It isn't the most convenient thing to load up all the dogs for a long trip, but I feel it is part of what we need to do. Experts feel very strongly all breeding dogs should have the annual CERF/CAER exam. Ideally Aussies pups should have their first one before 8 weeks of age. The opthamologist can sometimes see things in puppies at 7 to 8 weeks of age that they will not see again for a few years. The reason the test is done annually is that like in people, eyes can change over time. It's not a guarantee a dog will never pass on inherited eye problems, but will lower the chance since the dog itself is not affected. At the time of the exam a form will be provided and signed by the doctor, showing the dogs have normal eyes or if there is a problem, what it is and where it is located in the eye. Copies can be provided to puppy buyers or a breeder can send that into CERF for an official certificate. UPDATE: CERF is no longer in business so eye test results go to OFA and are called CAER (Companion Animal Eye Registry.) It's the same concept, just a different name and listed with OFA. There is a newer genetic test that is recommended. It was developed by a group in England and tests for one form of hereditary cataracts common to Aussies. The link with info is below in the links section. The HSF4 test is a simple genetic test that can determine if a dog has one or two copies of the mutation responsible for the most common form of cataracts in Aussies. It should be noted that there are other hereditary forms of cataracts in the breed, which is why annual CERF exams are important. The HSF4 mutation is responsible for about 70% of cataracts in Aussies, but the other 30% are caused by other genes for which at this point, there is no DNA test. To get an OFA rating, an x-ray is taken of the hips or hips and elbows by a qualified veterinarian, and sent to the board at OFA. There it is evaluated and given a grade of excellent, good, fair (all passing) or the non passing mild, dysplastic or severely dysplastic. 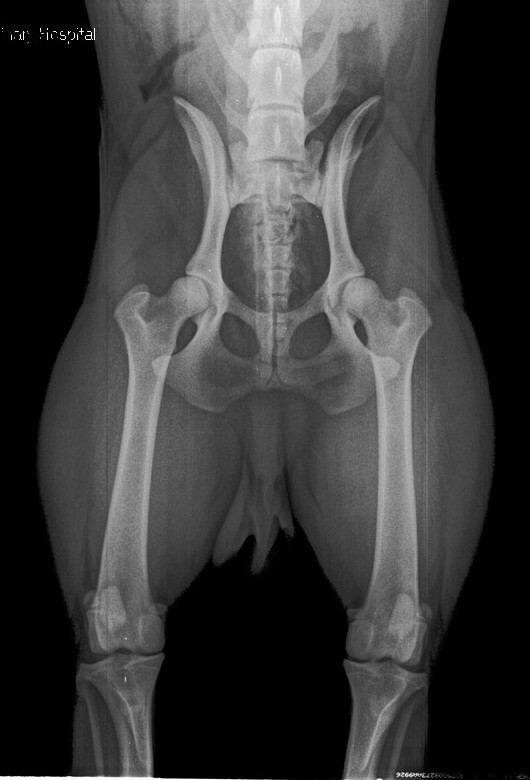 While this doesn't show if a dog may carry the genes to produce hip problems, it shows the dog itself has normal hip structure. By doing this test with all breeding dogs, we do all we can to lower the chances a pup may inherit hip or elbow defects. Here are two pictures of a hip x-rays taken to send to OFA for evaluation. The one on the left came back with a rating of Good and on the right Excellent. I have heard breeders say they don't bother testing because even dogs from OFA good or CERF/CAER clear parents can still produce affected offspring. To me that is a cop out as if you are breeding dogs that are not tested, you don't know if they themselves are affected and have a much higher chance of passing on defects. You can't tell by looking if your dog has many of these defects. Also, a good breeder will keep in close contact with all puppy buyers to assess how the pups from a various breedings will turn out, and use that information to make better future breeding plans, which may include retiring a dog who produces serious health defects even though the dog itself passed health testing. I know health screening costs money and time, but not nearly so much as what it will take to deal with a pup who inherits serious conditions. To me doing the health testing is just one important part of the responsibility of a truly dedicated, good breeder. By doing the recommended health testing, a breeder is doing all she can to reduce the incidence of hereditary health problems in the breed she works with. It is not a totally "guarantee" nothing will ever crop up, due to the complex ways genes may work together, but it is far better than doing no testing at all. There are other tests a breeder can do, and more being developed all the time. The ones I have listed above are the core tests, especially for hips and eyes. They are the minimum tests that should be done on all breeding dogs. At the bottom of the next list of links, is one that lists the recommended health test protocol on the ASHGI site.